Weekends are for comfort food. The made-from-scratch kind, steeped with the flavors of fresh, green herbs and slow-roasted garlic. The kind that makes a sinkful of dirty dishes and leaves your kitchen powdered with a delicate dusting of all-purpose flour. Savory food that’s made perfect when tucked into folds of buttery, hand-rolled pie crust. Food that is just as satisfying when eaten fresh from the oven as it is cold from the refrigerator in the middle of the night. For me, ratatouille has always been one of those foods. A humble Provencal dish of colorful stewed vegetables it makes a hearty supper spooned over slices of chewy, artisanal bread and an even better breakfast, heated gently and topped with a soft, poached egg or two. 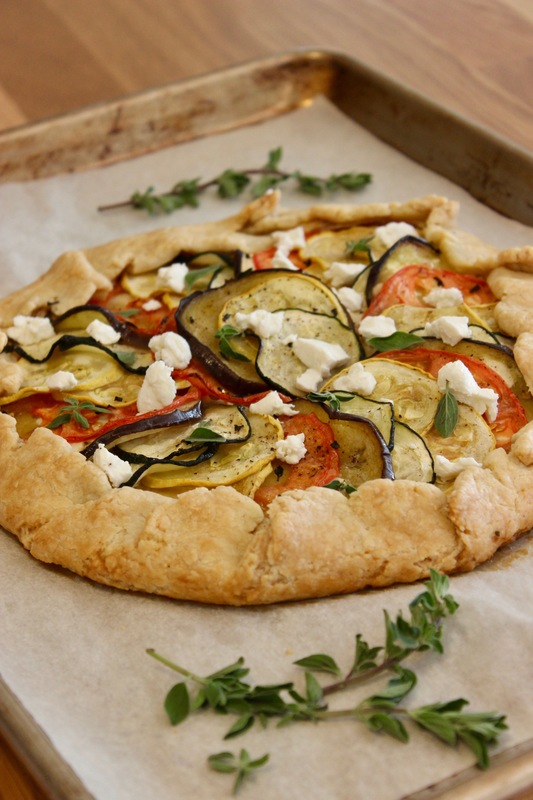 Hence the inspiration for this galette: eggplant, summer squash, and tomato roasted together in the oven, until each vegetable is wonderfully soft and sweet. Layered over a sturdy, homemade short crust and a blend of cheeses, these vegetables take on new life. The weekend is now just hours away: slow down, unwind, and take joy in experience of baking from scratch. 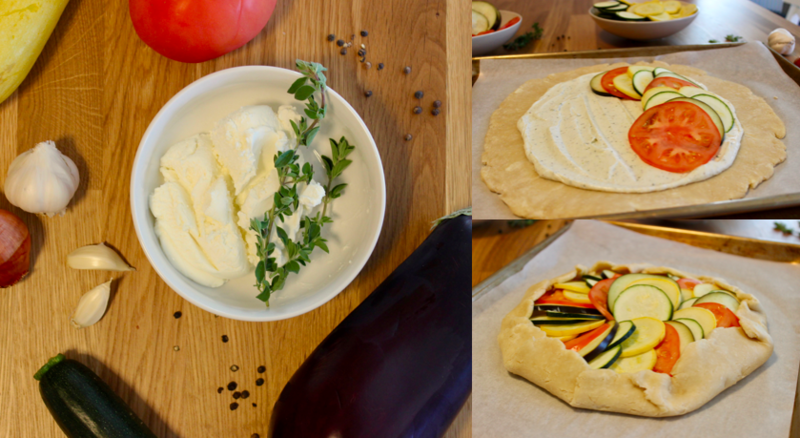 This ratatouille-inspired dish takes a bit of time from start to finish but it isn’t difficult to make. And when you smell it baking in the oven you’ll know, even before you’ve had the first bite, that it was time well-spent. Whisk together the flour and salt. Add the butter and mix in an electric mixer until the pieces of butter are the size of lentils. Then, with the mixer running, add the water a few tablespoons at a time, just until clumps start to form. Be careful not to make the dough too wet. Turn the clumps of dough out onto a piece of waxed paper and gently press them into a disk. Roll the disk of dough with a rolling pin until it is about 12 inches in diameter. Chill the dough in the refrigerator for 30 minutes. While the dough is chilling, combine the ricotta, goat cheese, garlic, shallot, oregano, and pepper in a food processor. Mix until smooth. 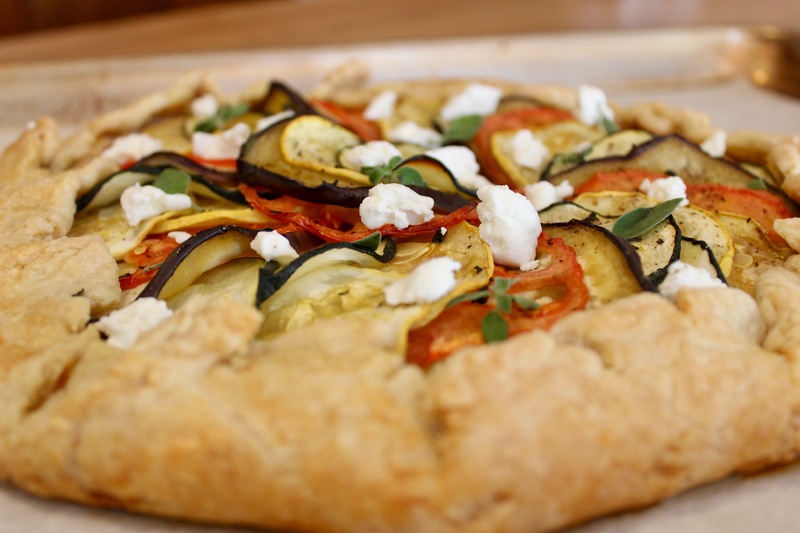 Remove the dough from the refrigerator and place it on a parchment-lined sheet pan. Spread the cheese mixture in the center, leaving a 1½-inch border of dough. Arrange the vegetables on top of the cheese mixture. Then, carefully fold the edges of the dough over the filling in sections, leaving the center of the galette exposed. The dough will overlap itself in places. Crack the egg into a small bowl and combine it with 2 tablespoons of water. Whisk to create an egg wash. Brush the egg wash lightly over the crust. Sprinkle salt over the top of the galette. Bake 20 minutes in the preheated oven. Then, rotate the pan and drizzle the olive oil over the top of the vegetables. Bake 20 minutes more. Increase the heat to 400°F and continue baking until the crust is golden, about 20 minutes. Cool on the sheet pan before serving warm or at room temperature, topped with goat cheese crumbles and fresh oregano leaves.